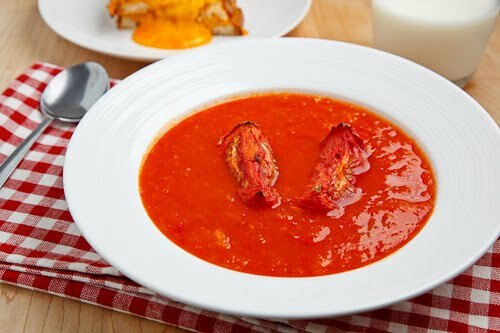 Roasting tomatoes brings out their flavour making this simple tomato soup oh so good! In fall when the weather starts cooling down, soups are once again on the menu and as far as soups go it is hard to beat the simplicity of a good old fashioned tomato soup. Luckily tomato soup is very easy to make at home from scratch so you can enjoy it whenever you want. As with many vegetables, roasting tomatoes concentrates their flavour and those tasty roasted tomatoes make some of the best tomato soup around. This soup is as easy to make as roasting all of the veggies, throwing them into a pot with some broth to simmer before pureeing. It is best to use fully ripe field tomatoes for maximum flavour but if they are not in season, do not worry as roasting those green house tomatoes will bring out their flavour nicely. You can serve your tomato soup plain but it is always nice to garnish it with something like croutons , feta, blue cheese, a dollop of basil pesto or even sour cream. Of course no bowl of tomato soup is perfect with out a grilled cheese sandwich for dipping! Place the tomatoes, red pepper, onions and garlic on a baking pan with the cut sides up. Drizzle a bit of olive oil over everything and season with salt and pepper. Roast in a 375F/190C preheated oven for 45 minutes. Place everything but the cream into a sauce pan and simmer for 15 minutes. Puree with a hand blender to desired consistency and mix in the cream. Looking for more soup recipes? Get the Closet Cooking Soup Cookbook Tasty Soups! I would love a bowl of that tomato soup right now! Fig jam sounds delicious. I think it would be great on a toasted muffin. I myself am not a fan of the tomato, however my husband and father-in-law are and I truly think they would love this soup. My favorite soup in the world! Looks delicious! A perfect cup of soup on a cold night like this. There is something so comforting about hot soup and a grilled cheese sandwich. Great job! My husband would love this, especially with the tomatoes being roasted. I bet the flavors are amazing. Roasting veggies is one of my fave ways to conentrate flavour..this soup & a sandwich…all in! I have been roasting tomatoes every weekend for the last month or so. Luckily, living here, there are still plenty left. A soup was definitely one of the things I had planned for them so this of course sounds great! A nourishing bowl of goodness you have produced here. Kevin’s roasted tomato soup should be on the menu of every fine restaurant. Looks delicious! I make a version where I slip in a little cream at the end, but I think next time I will have to go your route and skip the cream for a grilled cheese sandwich instead! That soup looks like something I would love. tomato soup is one of my favorites, and yours must have so much added flavor from the roasting. u know i recently learned the French do NOT pair cheese with sweet spread and jams as we do. Interesting. We Cubans do it all the time. Back to ur bowl of soup: delicious looking. A Mexican white cheese would have been good too. Ah, This is just sublime. Roasting would not only caramelize the sugars but also get rid of excess water– better flavor! Looks so deeply red too, gorgeous. Love the rich color of the soup, and I can imagine the deep tomato flavor, too. Oh lord. I just finished dinner, and now I’m hungry again after seeing this soup! love roasting things, so fantastic and easy! and fig jam on a grilled ham and cheese? yum!! This sounds so very good! everything is roasted, I almost can’t imagine how intense the flavours are gonna be! I am already missing the summer fruits…but I see plent of produce around, just different ones. The soup looks nice, to me it’s a perfect pair with a grilled cheese. The combination of your sandwich and this soup sounds absolutely amazing! I love the deep red color of the soup. Oh I would love this so much …. if only I could prevent myself from chowing down on the tomatoes as soon as they are out of the oven!And that sandwich … lordy, I could eat that right this minute! YUM! Mmm – I might stop by the last of the Farmer’s Market and pick up the last batch of tomatoes. Looks so good and sounds very easy to make. Great recipe! Oooh now that soup looks lovely! I’m loving the roasted tomatoes. It’s breakfast time here but I could eat that right now! I love roasted tomato soup! Yours looks lovely. It is the best combo of summer produce, but with cooler weather comfort. Yum! Kevin, this soups looks very yummy!! Loads of flavor there! Cheers! Yum! This looks delicious. I’ve been thinking a lot about making some roasted tomato soup lately (it seems good for the fall), so I’ll have to try your recipe out. Thanks for sharing. perfect for a cold fall day! i love tomato soup! 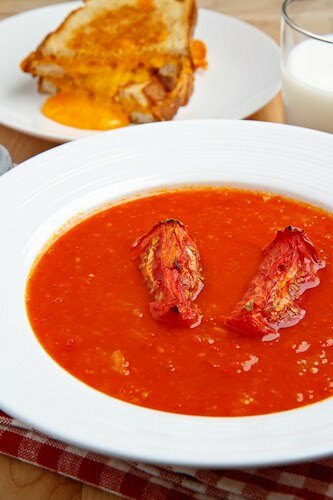 Roasted tomato soup sounds like heaven!! Sorry for not visiting for a while but I was busy redoing my site… 😉 Now most is done, but I’m still in “beta”… I will be making pumpkin soup this week, but next would love to try your soup. Another good one – looks great! I can tell from the rich color how delicious this is. I love tomato soup! Roasting does something absolutely amazing to tomatoes. Nice recipe! Really good looking soup. I love making grilled cheeses with a bit of sweetness, and fig jam does just that. Our market is already over for the year. So sad!! The soup looks nice and hearty. The weather has taken a turn for the worst, and this looks like a perfect soup to eat on a cold/rainy night. I don’t normally like tomato soup, but I always willing to give it another try, especially if the recipe is quite unique. What a perfect looking soup – and easy to put together! It’s freezing cold here in London that I need this bowl of soup to warm me up. Roasting definitely brings out the best in all of the major players in this soup. It sounds delicious! Wow look at the colour of your soup it is so intense. Ah, the simple things in life…grilled ham & cheese, tomato soup, fig jam…! This looks so good and the color is beautiful. I love roasted tomatoes. Wow! This sounds like the perfect dinner for a cold day. I love monte cristo sandwiches. We are having a cold snap of weather in the U.K. and this soup would be a perfect pick me up! I was hoping to make some tomato soup while we still had tomatoes in the garden, but I missed out this year. I’ll have to save this for next year! I’ll have to try this one – thanks! How beautiful!! A bowl of warm soup of that delightful color and ingredients, on these chilly evenings.. could not ask for more. I’m new to your site and love what you’ve posted so far. This toup looks delectable! That soup looks fantastic. Wonderful blend of veggies, and I’m sure the roasting makes for a great flavour. Now THAT’S an idea – tomato soup but roast all the ingredients first… I really like it. If you are fan of sweet and savoury, the other thing that I’ve done is to swirl a spoonful of marmalade through your tomato soup just before serving – wonderful! Jeanne: I have never tried adding marmalade to tomato soup. It sounds good and I will have to try it next time. A wonderful dish… I like the idea of roasting tomatoes for a soup, since it adds nutty flavor (which I love). Thanks for sharing! I made this soup, along with a grilled cheese, last night! It was great. I added dried basil to the soup and left out the dairy. Thanks for posting such an easy and delicious recipe! I roasted some fennel with the tomatoes and then added silken tofu when I blended it together. Vegan deliciousness! I love tomato soup. This recipe sounds amazing with everything being roasted…..yum! I made this tonight for dinner using nasty store-bought tomatoes, a small onion and some fresh basil, since I didn't have a red pepper. It was amazingly good, but I think would have been even better with the pepper. I'll remember to buy one next time for sure. Thanks so much for this recipe! I can hardly wait till summer when I can get some GOOD tomatoes to make this with. I served it with your jalepeno popper grilled cheese which was also amazing. You're a culinary genius. I love all of the recipes I've tried from your blog. I have a tendency to hoard my more "precious" ingredients so I decided to splurge and roast the tomatoes, garlic and onions with a spray of truffle oil and substitute saffron for the paprika… YUM! I have a tendency to hoard my more "precious" ingredients so I decided to make this soup by roasting the tomatoes, onions and garlic with a spray of truffle oil and substitute saffron for the paprika… YUM! This soup looks awesome. As soon as summer's fresh yummy produce hits the grocery stores I am so making this. This is perfectly light yummy summer dinner food. Until then, I recreated it using some pantry staples. Thanks for the inspiration for the pantry recipe! I am sure yours tastes better… fresher is better.